[Guide] How to Earn the Mewtwo Master Title in Pokémon: Let’s Go, Pikachu! & Pokémon: Let’s Go, Eevee! If you’re reading this, congratulations are in order. Having triumphed over the Elite Four and becoming the Champion, you have completed the first true step of your Pokémon: Let’s Go, Pikachu!/Pokémon: Let’s Go, Eevee! journey and it is time to take the next step, beating the Master Trainers. Like with Meltan, the first thing you will need to do to even attempt at getting the Mewtwo Master title, is to capture the Level 70 Mewtwo from Cerulean Cave. Once Mewtwo is yours, you can then leave the cave completely, only to go back to the spot where you caught Mewtwo, to battle a certain trainer (No Spoilers) and obtain both Mega Stones for Mewtwo. 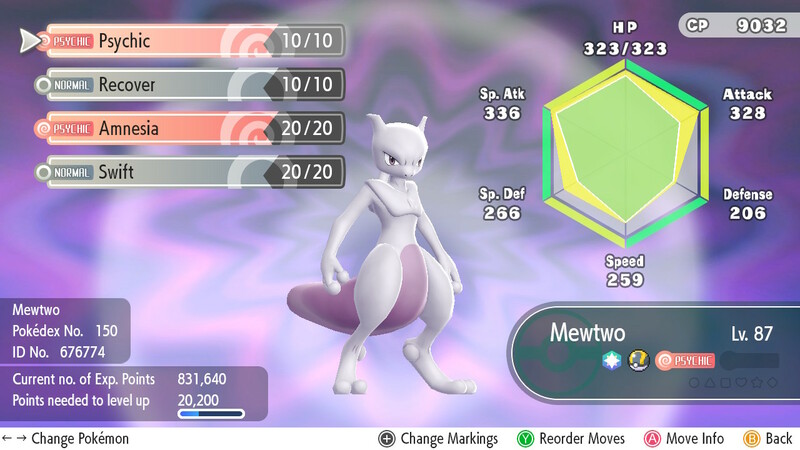 Getting the stones isn’t a requirement for obtaining the Mewtwo Master title, but if you have Mewtwo in your party, it will allow the Pokémon to gain some much-needed EXP and maybe even level up. Although Mewtwo is not required to reach Level 100 for the title, you do need to have a Mewtwo with more than 9000 CP. So, be prepared to either stuff Mewtwo silly with Candy, chain combo catch a lot of Chansey, or do a lot of battles. As always, we hope you found this guide helpful, but should you require more help, you can always click here to check out our other Pokémon: Let’s Go guides. Tags: Guide, Mewtwo, Mewtwo Master, Nintendo Switch, Pokémon Let's Go!, Pokemon: Let's Go Eevee!, Pokemon: Let's Go Pikachu!